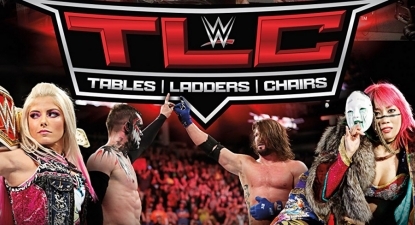 WWE just finalized the official cover artwork for this past Sunday’s TLC PPV! The TLC: Tables, Ladders & Chairs 2017 DVD will feature a chaotic card of matches that, due to medical issues suffered by two Superstars, WWE was forced to change in part at the very last minute — but those changes would lead us to the in-ring return of Kurt Angle and an impromptu, first-ever match between AJ Styles and Finn Bálor, on a night Asuka would make her RAW debut. The TLC DVD will land in the United States this time next month (soon to be listed on Amazon.com) and will follow to the United Kingdom in December (already listed here on Amazon.co.uk). Let’s take a look at both sides of the official artwork. The front cover features The Shield Kurt Angle, Seth Rollins and Dean Ambrose as Kurt replaces Roman Reigns on the original event poster. The back captures a moment that was just “too sweet” and reveals an extra planned for the DVD. Kurt Angle returns to the ring to team with Seth Rollins and Dean Ambrose against The Miz, Sheamus, Cesaro, Kane and Braun Strowman. The Empress of Tomorrow finally arrives as the undefeated Asuka makes her explosive WWE debut versus Emma. “The Demon” Finn Bálor takes on AJ Styles in their first-ever in-ring meeting. Alexa Bliss defends her RAW Women’s Championship in a challenge from veteran Mickie James. Enzo Amore looks to reclaim his WWE Cruiserweight Championship from Kalisto. Plus, more! The Superstars of RAW leave no Table, Ladder or Chair unturned at WWE TLC. – United States: November 28th. Pre-order the TLC 2017 DVD very soon here on Amazon.com. – UK/Europe: December 11th. Pre-order a copy of the TLC 2017 DVD now on Amazon.co.uk. – Australia: TBA. Look out for your pre-order announcement soon over at Madman.com.au. Best PPV of the last year imo. How come it isn’t part of a Double Feature Pack? Because the next PPV is Survivor Series which will be a double dvd by itself. Clash of Champions will also be by itself. I guess they don’t want to release them out of order. Enjoyed this PPV. I liked all three women’s matches. I liked how the Asuka/Emma match was booked, Empress of Tomorrow taking bumps. Both competitors looked strong in the outcome and more so on the following night on RAW. Asuka gets to be dominant without being dominating. It’s great seeing Alicia Fox getting some love and making the RAW women division more interesting. I actually hated that. Asuka wasn’t dominant at all. Her debut match and she goes 50/50 with Emma, who hasn’t meant anything in years. Not the way for casual fans who don’t watch NXT to care for her. Going 50/50 with a women’s midcarder, two nights in a row no less, just makes Asuka seem like just another wrestler on the roster. Hopefully Asuka will earn the respect of casual fans by putting on stellar performances in order to stand out apart from powerhouses Strowman, Lesnar, and Goldberg. WWE may be trying to play safe with Asuka, not wanting to push her too fast only to flounder after plowing through at least half the roster. You got me thinking, now I want to see where she goes. My complaint about this ppv is that it was mostly normal matches no chair match or ladder match or table match just a TLC match. The cruiserweight title should have probably been a multi man ladder match. Yeah cruiserweight title match should of been ladder match women’s title match should of been a tables match and not sure which match should of been a chairs match? I could see the reason for having a regular match between Finn and AJ. But I see your point. I hope that Angle has a one-on-one match eventually. He looks rather good for being 48 and a 15 minute singles match I think would work, possibly at Wrestlemania 34. For a PPV that was force-ably changed, they overall did a great job. I would have preferred Angle’s comeback match to be at the Rumble or Mania, but WWE has always been huge on delivering what was advertised. In this case, they could not do so. Therefore, they gave fans much more than what they bargained for. My only complaint about the cover is that Angle’s picture looks like it’s from 2000 or something. Am I wrong? A recent picture of the three of them in the Shield gear would have been great. I thought the same about the Angle pic – maybe 2005 though. I wonder where the whole Shield reunion idea is going to go now that Reigns is on the shelf. Maybe this will give more spotlight to Rollins and Ambrose and unintentionally give Reigns a break to fresh up in the minds of the fans.